Stan Laurel and Oliver Hardy formed one of cinema’s first great comedy teams. By 1937, they had become world famous, with their body of work being translated into many languages. During this time, they were in the middle of making Way Out West, which would go on to become one of the most popular films in their catalogue. While making the film, Stan opts not to renew his contract, feeling the studio and producer Hal Roach fail to recognize the fame he and Oliver have enjoyed. However, his comedy partner is not released, being on a different contract. This snap decision results in the two of them being dropped by the studio. Sixteen years have passed since that day, and the comedy duo is about to embark on tour of the British Isles. The first compliment I must pay Stan & Ollie becomes apparent within the first minutes of the opening scene. 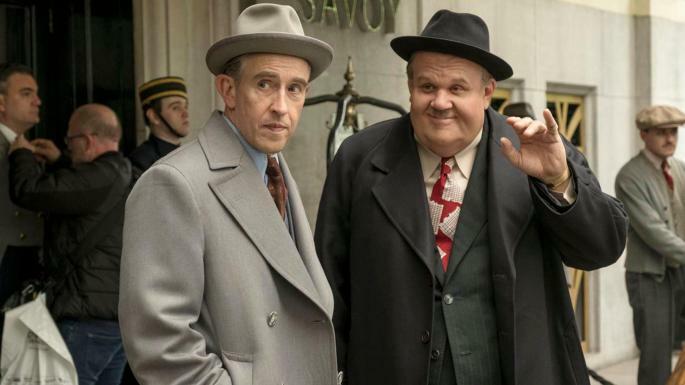 Steve Coogan and John C. Reilly are dead ringers for Laurel and Hardy. However, it wouldn’t be enough if they merely resembled the legendary comedy duo, so a significant part of what makes the performances so great is that they perfectly emulate Laurel and Hardy’s mannerisms. Though one routine is invented for the film and is based off of word-of-mouth recollections, the uninformed would be none the wiser. It’s one of those situations in which you might find yourself actively reminding yourself these are actors. There isn’t really a set template for how one goes about shooting a biographical dramatization. Some choose to follow a subject throughout their career while others choose to solely focus on the apex of their relevancy. 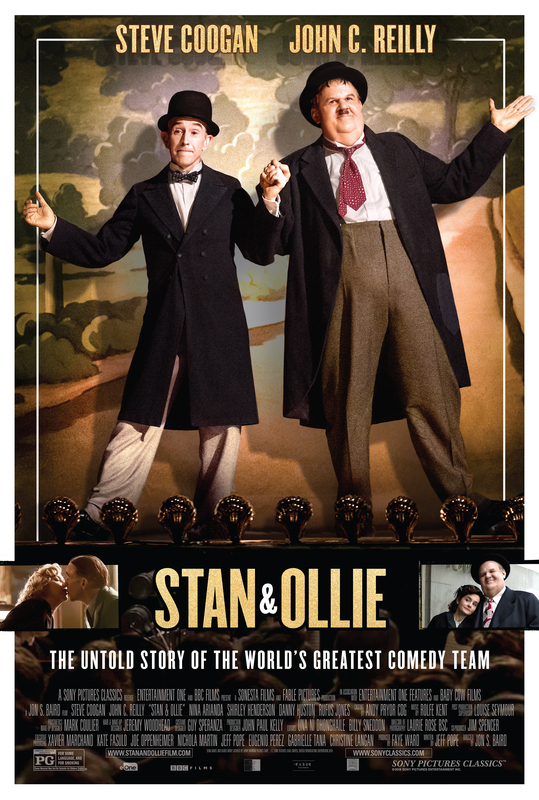 Stan & Ollie goes in a decidedly unusual direction by setting majority of the film in 1953. By this point in history, Laurel and Hardy’s glory days were long behind them. This is evidenced by their first few performances wherein they play to a theater only half-full – if that. While in most cases, it would suggest the duo are faded stars from a bygone era, in their case, they relied solely on their names. Their promoter then suggests they do some more publicity in newspapers, radio, and newsreels. Once the public is actually aware of their tour, the duo slowly, but surely finds an audience. As what commonly happens in reality, quite a lot of the fans who show up to meet the duo in person are older people. Part of the driving force behind this tour is for the duo to secure funding for a film – a comedic take on Robin Hood. Though the tour appears to be going well, their London-based producer is eerily silent. Only when Stan breaks into his office does he learn the awful truth: the project has been officially canceled. Devastated, Stan finds he can’t bring himself to tell Ollie, and they continue to pitch ideas for the film. Hilariously enough, it’s revealed near the end of the film that Ollie knew all along, resulting in a classic “I know you know” routine. What I enjoyed the most about this film is that Mr. Baird was able to interject many comedic moments in between the duo’s performances. Usually when this happens – especially in a biographical film – it comes across as hackneyed and insipid, but the production team was able to make them work. This is because most of them are obviously staged; Stan and Ollie, being the masters of comedy that they are, can’t help but take their act on the road – even if they’re playing to small audiences. Meanwhile, the amusing moments that aren’t staged come are limited to witty banter, which, while highly stylized, comes across as more down-to-earth and realistic. Because a story wouldn’t be interesting without some kind of conflict, Stan & Ollie does feature the typical breakup that occurs around the second act. The catalyst is when Ollie’s wife brings up the “elephant movie” he had starred in after their contract expired. Being one of the few features to star Ollie, but not Stan, this causes bad memories to resurface. The two have a falling-out due to Stan thinking of Ollie as lazy and Ollie believing that he and Stan only became friends because Hal Roach paired them up. Despite this black mark on their friendship, the two press on, though Ollie refuses to speak with Stan. However, when they are about to act as judges in a beauty contest, Ollie suddenly collapses from a heart attack. The prognosis is grim, and Ollie is to stop performing for the sake of his health. Though Stan is offered a replacement, he refuses and is ready to end the tour. Believing the show must go on, Ollie decides not to spend the rest of his life idle and prepares to perform. What I enjoy about this moment is that it’s inspirational without being disingenuous. The film paints Oliver Hardy as a true showman, continuing with the tour despite his failing health. At the same time, it’s clear he can barely stand during the shows – to the point where it’s a genuine miracle he didn’t simply collapse and die onstage. Not only that, but once the tour concluded, the duo never performed again. Ollie would die four years after the events of the film and Stan retired, though he wrote Laurel and Hardy sketches for the rest of his life. While it can be difficult to discern a professional relationship from a personal one, it’s clear the two were close despite their ups and downs over the years, and their contributions to comedy will never be forgotten. The year 2018 saw no shortage of biographical features, and I have little doubt Stan & Ollie is among the stronger ones. In addition to choosing intrinsically fascinating subject matter, the performances of Steve Coogan and John C. Reilly are very laudable, flawlessly channeling the famed comedy duo. It’s plain to see how they managed to enrapture critics. 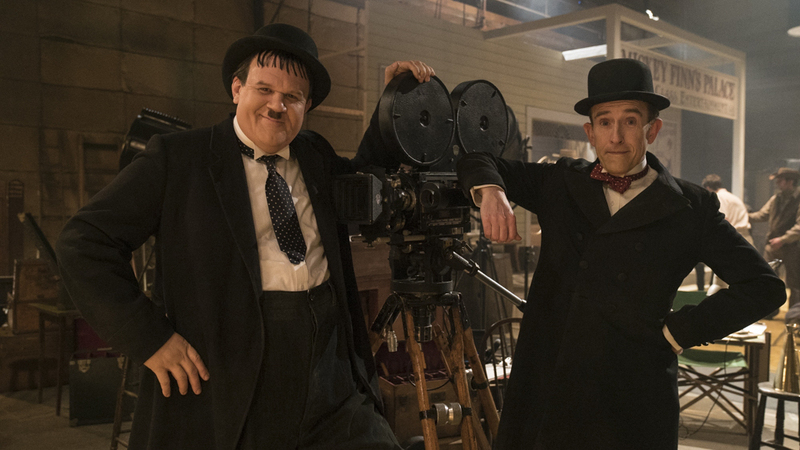 On a more basic level, Stan & Ollie stands out among the various 2018 releases in that it was perfectly fine with telling a story. As a result, it’s one of the few films from 2018 whose praise comes across as pure and genuine. That is to say, it was not helped along by nostalgia, franchise power, or a political statement journalists could get behind. The film could have been released yesterday and it would have gotten the same positive response. For those seeking out an overlooked film from one of the medium’s most incongruous years, Stan & Ollie is worth a watch. Great film but another biopic that suffers from the facts being manipulated to tell a juicier story. The performances really lift this though. I’ve never been a much of fan of Reilly but he was superb as Ollie. True, such as the fact that the Robin Hood film they were trying to make was being written quite a bit before 1953. Nonetheless, I’d say it was well worth watching for the performances alone. That was the least of the changes, to be frank, but that’s Hollywood I guess.